This 1964 very well made pot from Presto (Eau Claire, Wis.) has it all. Stainless steel in a very clean design and easy to clean. It perks from 4 to 12 cups of coffee with 1000 watts power and perks it fast. There is a light to tell you when it is done (the light goes off when done). It is completely immersible so cleaning is a snap. Even the aluminum basket and stem assembly are coated so they clean up easy. It is a gem of a pot and will make coffee for years. My mother has one she bought in 1964 (a 9 cup) and she still uses it every day to this date (I do keep it in shape for her, but it only needs cleaning). What a well made pot. and I could not be happier with this pot. I submitted the above review and in this time I've not had one issue with the percolator. You won't go wrong purchasing one of these from KitchenMade! on 5/25/2011 Love the Pot, Love KitchenMade, USA! 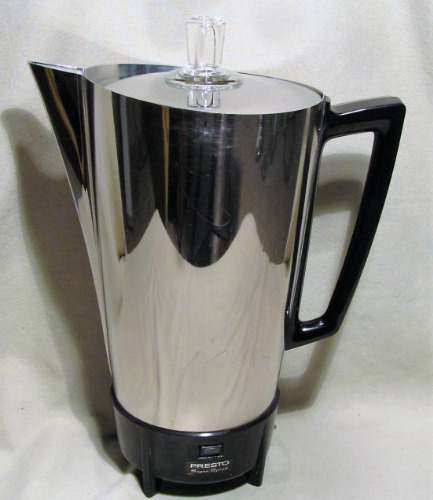 I have been a long time percolator user - I've recently had to replace my 'new' percolator three times over the years for the same problem over and over. I've spent well over $150 dollars on new percolators. I haven't had this pot for long yet, but I couldn't be happier. The coffee is piping hot, but not burnt. The filter basket is very generously wide so getting the grounds from my grinder is a snap. The pot is a priceless example of Jetson's era space age style, and is gorgeous on your modern granite counter tops. It arrived in like new condition, very carefully packaged so it wasn't damaged in shipping. It was honestly the work of someone who cares about what he does and the service he provides. I wouldn't have known it was a 50 year old percolator if it wasn't what I had wanted. It was shipped quickly and Frank did a great job of keeping me updated and following up after I got the pot to make sure I was satisfied. I know this probably sounds like an overly gushing review, but I honestly cannot say enough good things. I wish there were more vendors doing quality work with quality products like this one. I'm glad I have the internet to connect people like me with businesses like this. Thanks, Frank!